Patriofelis in the Museum's Past Worlds Exhibition. Photo © NHMU. About 50 million years ago, along the edge of an enormous lake that then covered much of Wyoming, a charismatic carnivore slunk through the thick undergrowth in search of its next meal. To our modern eyes, it might have looked something like a cat. The leopard-sized mammal had a blunt face, prominent canine teeth, clawed paws, and a long tail. But this was no feline. This was Patriofelis ulta. The Philadelphia naturalist Dr. Joseph Leidy named Patriofelis all the way back in 1872. Working from just part of the mammal’s jaw, he thought that this animal was very cat like. Hence Patriofelis means “father cat.” Over time, however, a different identity took hold. Today we know that Patriofelis belonged to an extinct group of mammalian carnivores called oxyaenids. These were some of the top predators of their time, evolving into forms similar to cats, dogs, and hyenas many millions of years before any of those modern groups of more familiar carnivorans became the dominant meat-eaters on the landscape. This is what biologists call convergent evolution - when different animals evolved similar appearances independently of each other. Another example of convergent evolution is how prehistoric reptiles called ichthyosaurs look very similar in shape to sharks despite having a very distant evolutionary history. Given that Patriofelis looked quite a bit like a cat, did it also live like one? That’s still something of a mystery. About 100 years ago the leading hypothesis was that Patriofelis spent a lot of time in the water and was something like a giant otter. This is because some paleontologists thought Patriofelis was a close relative of seals and sea lions. But this hypothesis was later thrown out and Patriofelis is understood to be a more terrestrial carnivore. Fossils from the Museum's collections. Photo © NHMU. Actual fossils of Patriofelis from the Museum's collections. The potential to find out more rests right here at the Natural History Museum of Utah. Within the paleontology collections rests a partial Patriofelis skeleton, including a beautifully-complete skull, that was uncovered by Golden York from the vicinity of Kemmerer, WY in 1953. The prominent teeth of our Patriofelis are worn - perhaps clues to what this beast was eating - and the bones of the rest of the skeleton might help experts better understand the range of motions the “father cat” was capable of. 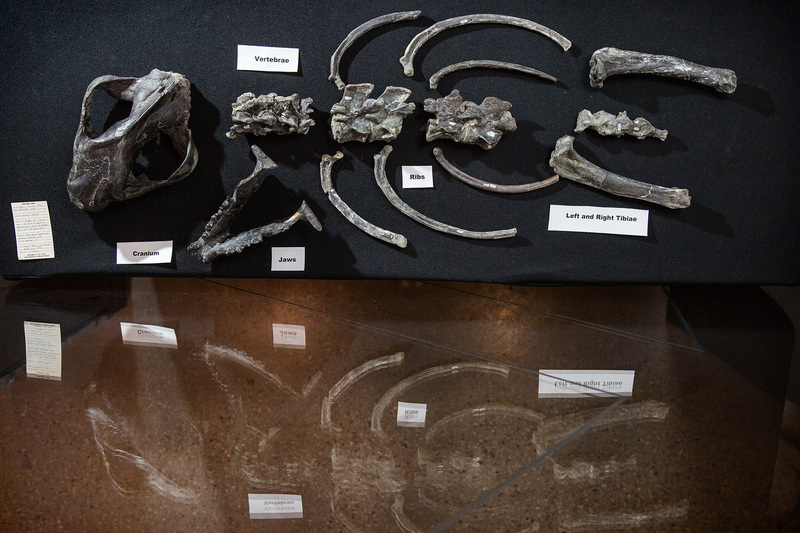 “If we could watch Patriofelis,” Duke Lemur Center paleontologist Matthew Borths says, “I think it would remind us of a lowrider cat or a giant otter.” Borths had a look at the bones himself during a recent research trip to the Museum. “I was at NHMU to take a look at its skeleton, especially its skull and teeth,” Borths says, “to try to figure out where Patriofelis fits in the mammal family tree.” Even though mammals like Patriofelis have traditionally been placed close to more familiar carnivores like cats and dogs, this idea is contentious and relies on teasing out whether similar traits between these groups were shared from common ancestry or evolved independently of each other. Analyzing the bones of Patriofelis and other carnivores may help solve the mystery. You can wonder for yourself. In the Past Worlds Exhibit in the Eccles Gallery, facing down the herbivore Uintatherium, you can see the reconstructed skeleton of Patriofelis. What was this predator doing as it roamed along the edges of the Eocene’s ancient lakes? The bones may yet tell us. Brian Switek is the author of My Beloved Brontosaurus, Prehistoric Predators, and a science writer for the Natural History Museum of Utah, a part of the University of Utah in Salt Lake City. Our mission is to illuminate the natural world and the place of humans within it. In addition to housing outstanding exhibits for the public, NHMU is a research museum. Learn more.